Goby's Grille and Pub in St Paul has much to offer, including taps of Michelob Golden Light and a jukebox. 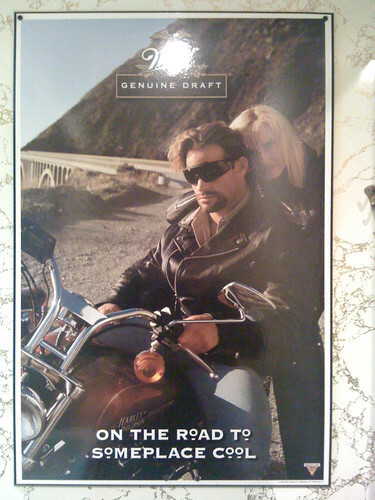 But, by far, their best overall contribution to their female patrons is the awesome MGD poster in the bathroom, which I felt compelled to share. The poster is mounted directly opposite the throne, which means all ladies alike can gaze upon its majesty while doing their biznaz. Get on the road to someplace cool! Thanks for the heads up, Rueben. I've relinked the poster, so hopefully it will work now.